Product prices and availability are accurate as of 2019-04-19 18:04:22 EDT and are subject to change. Any price and availability information displayed on http://www.amazon.com/ at the time of purchase will apply to the purchase of this product. 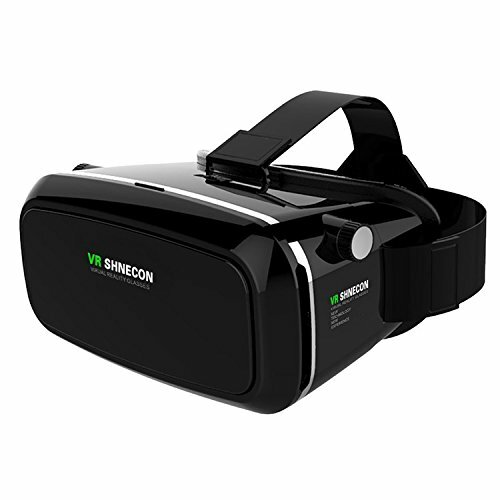 Shinecon virtual reality headset 3d VR glasses turns your smart phone into a virtual reality viewer. You can experience the immersive ,fun and exciting world of very: fly through the grand canyon, play 3d games ,travel the city streets of Paris or become a character in an animated film. 1.Shinecon 3d glasses with imported puma lens which the clarity is 30% higher than common lens in the market. Blue lights coming from mobile phones do damage to the eyes. With blue coating film, the lenses of this headset can reflect the blue light of your smart phone, safeguarding your eyes. 2.Head strap adjusts to comfortable fit most head types ,improved up leather material brings a soft fit around eyes area. 3.Net weight of the virtual reality glasses is only 380g which is the most comfortable weight for people to wear. 4.Magnet-adsorbed easy removing front cover ,you can charge and use earphone . Myopia(below 500 degrees) can directly wear it to watch. 5.Workable with smart phone with the size rang of 4.7--6.0 Inches . 2. In order to get a better visual enjoyment and field experience. It's better use a mobile phone with 1080p screen resolution or above and hd movie or game. 3.Pupil distance (pad) and focal distance (fad) button need be rotated with moderate force! 5.If you need to wear your myopia glasses, you need to first put your myopia glass in the headset first and wear the whole sets on head when everything is read. ?? IDEAL HEAT DISSIPATING DESIGHN - Front cover is adsorbed by magnet, super face foam protector, ideal heat dissipating design, makes the phone radiate faster than others and makes the phone cool while using, and great for ventilation for long use, also adjustable phone mount can hold your phone in place, you can charge and use earphone at the same time through the ventilation holes on both sides ?? VERY EASY TO ADJUST - Pupil Distance (PD) and Focal Distance (FD) to get the best 3D immersive experience: one knob for PD, another knob for FD. Pupillary Distance adjustment range: 55mm - 75mm. Myopia less than 600 degree is ok to use this item without wearing glasses ?? DOWNLOAD 3D VIDEO APP - This VR can't automatically transform images to 3D format, you need to download APPs with 3D format video or watch panorama videos on YouTube, QR code and video source can be found on Google. ?? 100% RISK-FREE SATISFACTION GUARANTEE - We are backed by 100% satisfaction warranty, so that you'll be amazed at how many hours of entertainment this 3D VR headset with remote and headphones can offer. This virtual headset is equally suited for iOS and Android devices making it a great iPhone 3D VR headset and a much better alternative for Google Cardboard. ?? UNBELIEVABLE 3D EXPERIENCE - Our virtual reality glasses give you access to an all new world in the comfort of your home. Watch 3D movies on your personal cinema-sized virtual screen visible only to you. Eliminate enemies in a first-person shooter, participate in a VR horror game or score a goal in a game of soccer as if you were a part of it. Set out for a virtual tour around the world or try an extreme roller coaster VR attraction - immersive experience assured by this VR headset!